African Collard Greens and Mediterranean Swiss Chard come together in this flavoursome East African recipe. Vegan, Gluten-Free and ready in under 30 minutes. 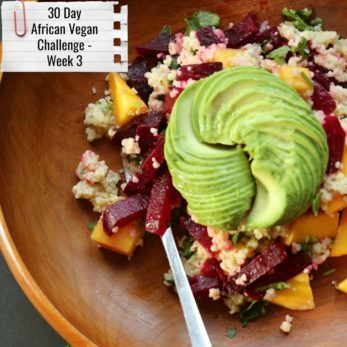 I am a few days into my 30-day African Vegan challenge and I have a confession to make. 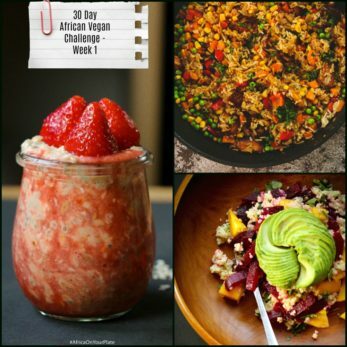 Before I started the challenge, I was worried about two things – worried about eating bland, boring food and worrying whether I would have enough energy to see my through the days. To my delight and pleasant surprise, I have been feeling awesome (mostly), with tons of energy. And, I have also reinforced the notion (at least to myself) that it really does not take that long to put delicious and nutritious plant-based meals on the table. Did someone say plant-based food is boring? 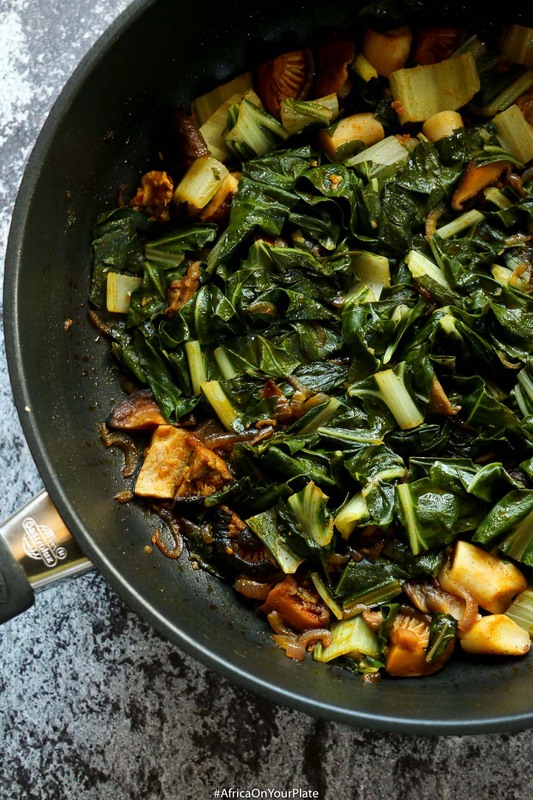 You just wait until you have tasted this sautéed collard greens, and I promise you will do a double-take. This dish called Sukuma Wiki in Swahili is made by sautéing some leafy green vegetables with other vegetables like tomatoes to make a savoury stew. Sukuma wiki means “stretch the week” as this dish evolved as a way to use up leftover meats, and stretch the leftovers to last a whole week. 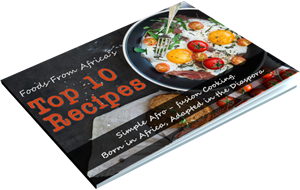 Collard greens are widely used in Africa as the leafy green vegetable of choice for sukuma wiki, but kale, and cassava leaves can also be used. In the south-eastern part of Nigeria, pumpkin leaves (ugu) are widely used in this recipe which is known as Edikang Ikong in Efik language. In this recipe, I have sautéed collard greens in palm oil. 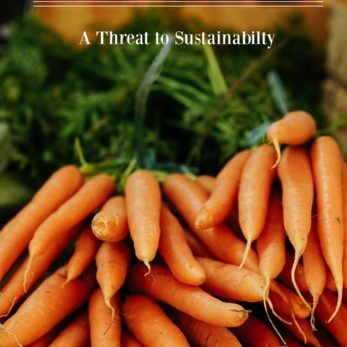 Now, I am all too aware of the controversy regarding palm oil and veganism, and while I dont want to get drawn into taking sides in that argument (both sides do have their merits), the vegan society have summarised that in itself, palm oil is a vegetable product which does not need to involve the (ab)use of animals, and therefore is suitable for vegans (1). 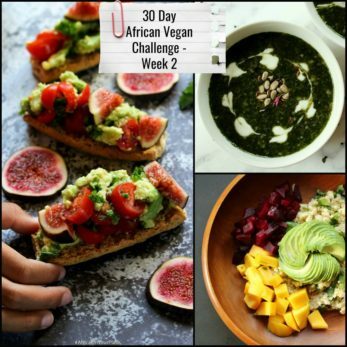 Importantly though, I feel comfortable including sustainably-sourced palm oil in my list of allowed foods for this 30-day African Vegan challenge. I would urge you to do what feels comfortable to you. If you must stay away from palm oil, replace it with coconut oil for this recipe. Coconut oil works just as well. Traditionally, sukuma wiki is made with meat, preferably beef, which imparts a wonderful umami flavour to the dish. 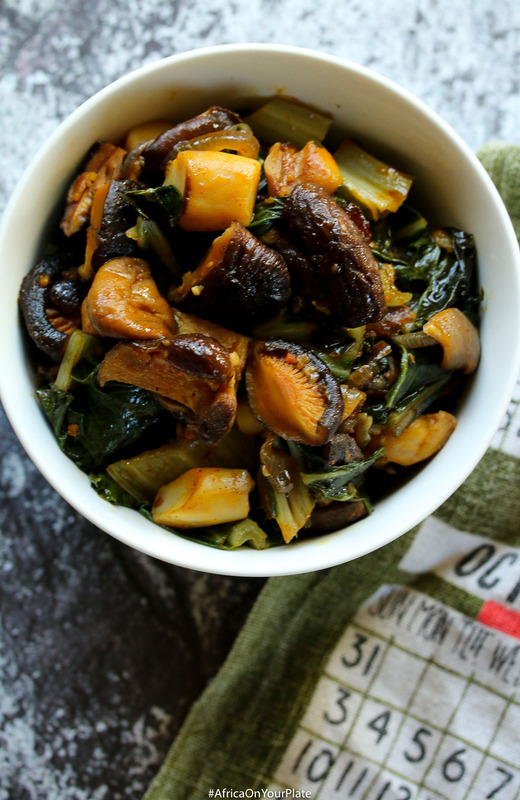 However, in keeping with my vegan theme, I have excluded meat from this recipe, and I have used shiitake mushrooms to impart that drool-worthy umami flavour that is the mark of this dish. 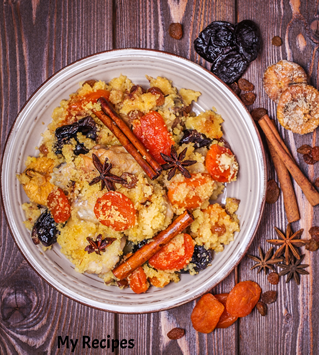 This recipe is not complete without mentioning the berbere spice. 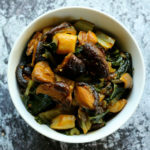 Think smoky, and earthy sauteed collard greens with a bit of a bite! 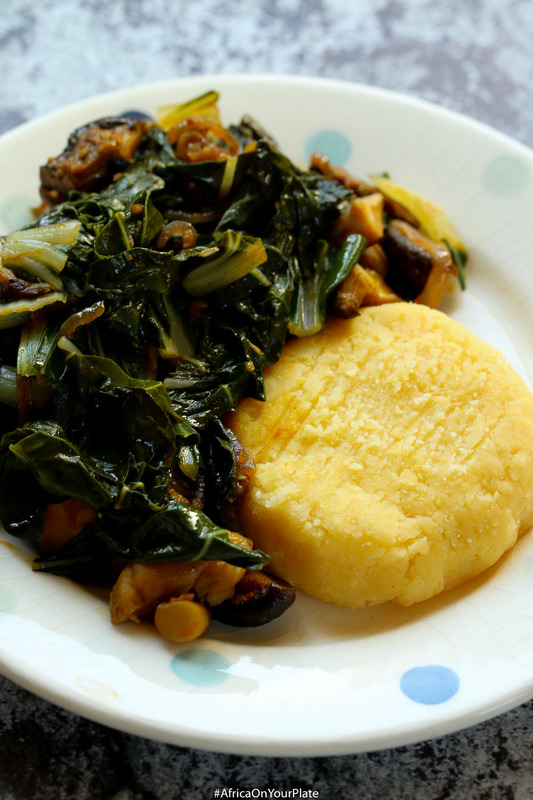 Serve it with plantain mash, or with African cornmeal mush (ugali) as is customary in Kenya. African Collard Greens and Mediterranean Swiss Chard come together in this flavoursome East African recipe. Finely chop the onions and roughly chop the collard greens and Swiss chard. Add the dried shiitake mushrooms to a bowl of boiling water. Leave to rehydrate for approximately 15 minutes. When sufficiently rehydrated, roughly chop the shiitake mushrooms and set aside. Wash and roughly chop the fresh mushrooms and set aside. 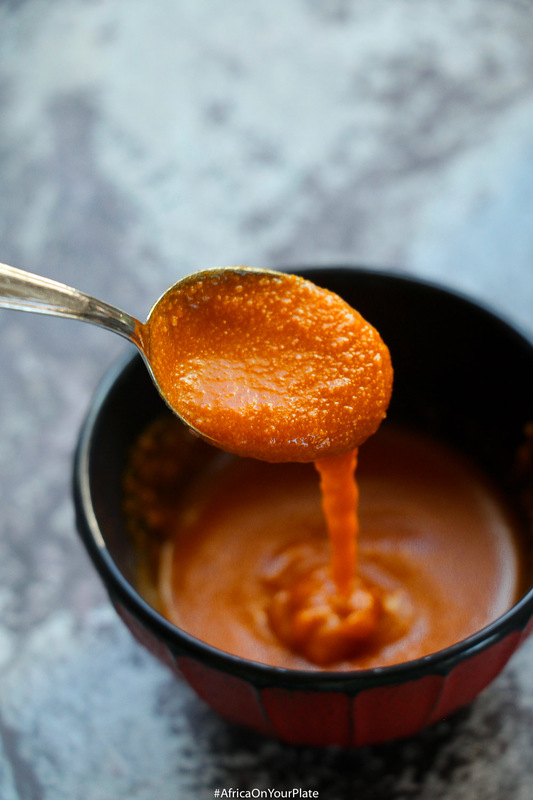 Set a saucepan on medium heat, and when hot, add the 3 tablespoons of palm oil. When the palm oil is hot, sauté the chopped onions and garlic for 3- 5 minutes, stirring frequently. When the onions have sweated and are soft and translucent, add the mushrooms and collard greens. Season with the berbere spice, vegetable stock cube, salt and black pepper. Sauté for 5 minutes, stirring occasionally. Add the Swiss chard and cook covered for 10 minutes. Take off the heat, and leave covered for another 5 minutes. Serve with African cornmeal mush (Ugali).